According to a new market report published by Transparency Market Research titled “Network Security Policy Management Market – Global Industry Analysis, Size, Share, Growth, Trends, and Forecast, 2018 – 2026,” the global network security policy management market was valued at US$ 1,297.6 Mn in 2017 and is expected to expand at a CAGR of 8.2% from 2018 to 2026, reaching a value of US$ 2,614.2 Mn by the end of the forecast period. According to the report, North America was a significant contributor to the network security policy management (NSPM) market in terms of revenue in 2017. The prominent market share of the region is due to the high adoption of cloud technology, and technological advancements in the field of network security, especially in the U.S. and Canada. The global network security policy management market is currently driven by increase in number and intensity of cyber-attacks. Increasing number of attack instances especially in government and BFSI industries is a major reason for rising demand for network security policy management solutions. The growing need for secure file transfer and stringent regulatory compliances are expected to further fuel the network security policy management market. Many industry and government regulations and standards are being designed to protect the confidentiality of sensitive data residing at different sources including the cloud and on-premise. Some of these regulations include European General Data Protection Requirement (GDPR), U.S. state and Federal data privacy laws, HITECH (Health Information Technology for Economic and Clinical Health), and HIPAA (Health Insurance Portability and Accountability Act), apart from PCI data security standards, financial services laws, and various healthcare laws. Growing adoption of such stringent regulations to safeguard sensitive data by several government entities are expected to boost the adoption of NSPM solutions in the coming years. Lack of awareness about cyber threats among enterprises is one of the major factors limiting the market growth. 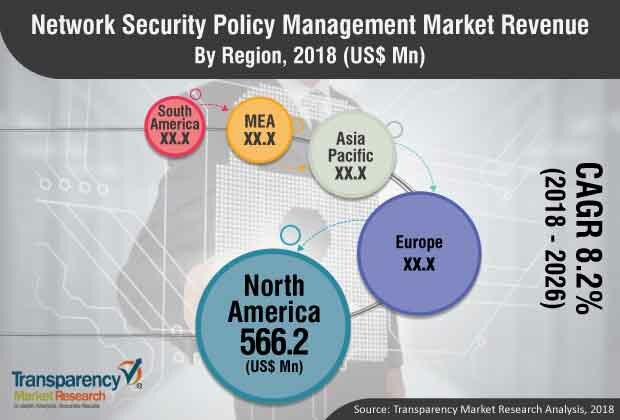 The global network security policy management market has been segmented based on component, solution, enterprise size, industry vertical, and region. Based on component, the market has been classified into software and services. Based on software, the market has been classified into cloud and on-premise. The cloud segment has been further split into public, private, and hybrid. The cloud segment is expected to expand at a high CAGR, thus becoming the leading revenue generating segment by 2026. This is mainly because of increase in adoption of cloud based technologies, especially across Europe and Asia Pacific. Based on solution, the market has been classified into security policy management, change management system, risk and vulnerability analysis, and application connectivity management. Based on enterprise size, the market has been divided into small and medium enterprises and large enterprises. In terms of industry vertical, the market has been divided into Banking, Financial Services and Insurance (BFSI), Healthcare, Government, IT & Telecom, Retail, Transportation, Energy & Utilities, and Others (Education, Manufacturing). Based on region, the global network security policy management market has been categorized into Europe, North America, Middle East & Africa, Asia Pacific, and South America. The market in North America is expected to maintain its dominant position throughout the forecast period. However, Europe and Asia Pacific are also anticipated to constitute significant market share in the coming years. Key players operating in the global network security policy management market include Palo Alto Networks, Inc., AlgoSec Inc., Check Point Software Technologies Ltd., Forcepoint LLC, FireMon, LLC., Hewlett Packard Enterprise Development LP, IBM Corporation, Juniper Networks, Inc., Sophos Ltd., and Tufin Software Technologies Ltd..